90% excellent but the bad episodes really bring it down. Still, very consistent (Unlike S2) and the special features are better than ever, so 8/10 from me. With the new arrival of Freema Agyeman came a Doctor Who series far better than the previous two overall. This season had far more going for it than the previous two. And it kept me entertained. David Tennant at last has some decent stories to get his teeth into in succession. I was glad the series picked up here, for up to this point I was disinterested in the series as a whole. This is the start of the big comeback. And we have our first coloured companion, which is an excellent and new move for the series. About the only weak stories amidst this lot are the two dalek episodes. And even these are stronger than the weak ones in the two previous series. Even saying that this is a better two parter than the series two finale. For one the daleks are in it more, and that is rarely a bad thing. But again the story overall feels like nothing that new. The new dalek looks rather strange as well, if you know what I mean. But stories like Human Nature/The Family of Blood and Blink are truly excellent tales. Fresh and imaginative and very vivid in the storytelling. They unravel surely and never lose coherence throughout. The characters are all likeable and the aliens are all suitably unsettling. The Lazarus Experiment boasts perhaps the best monster of this series, followed by the Weeping Angels. And 42 is about one of the best of the new series stories over all. And Michelle Collins is in it, which is never a bad thing. Smith and Jones got the series off to a flying start, in being better than the first two introductory episodes of the two series beforehand. And the Judoon are a pretty brilliant set of new aliens. One of the better new monsters to appear in the series. The Shakespeare Code's ending too is highly original. Words as a defence have never been so effectively used within a story. Gareth really excelled himself here, as he does with the Lodger. Gridlock is interesting as it brings back the Macra from long ago. They look brilliant here. And that hymn sung half way through is no light moment. This is the kind of story I would love to see a lot more of. 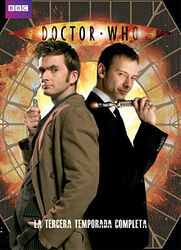 Of course though, it is the return of the MASTER that is this series best and most memorable moments. First Derek Jacobi, and then John Simm, both breath new life into the character first so wonderfully brought to life by Roger Delgado and then carried on by so many fine actors. I only wish Derek could have had a bit more time to develop as the Master before changing, but one cant have everything can they? And that old Doctor gave me the creeps. Such effective makeup and design work there. That old Doctor was the first real scene to truly unsettle me in the new series up to this point. So on the whole, this series was excellent. It finally had a run of top notch stories, with very few flaws and weak moments. Great stuff.